Located on the shore near the entrance to Hyannis Harbor. Privately Owned. As Hyannis was becoming a busy fishing port, the demand for a lighthouse was needed to guide mariners around the treacherous waters located southeast of Hyannis Harbor. The first light was displayed as a lamp hung in a window of a shack for a number of years by Daniel Hallett before a lighthouse was built in which he was appointed as Keeper in 1849. This only lasted for a couple of years since he was replaced for political reasons, which occurred quite frequently in those days. From 1871 to 1899 John Lothrop and his son Alonzo Lothrop tended the light spanning nearly three decades of family service. For a number of years in the late 1800’s, Hyannis Harbor Light became a rear range light to a simple front range light built on the Old Colony Railroad wharf, which was a lamp, hoisted on a 20-foot tower. 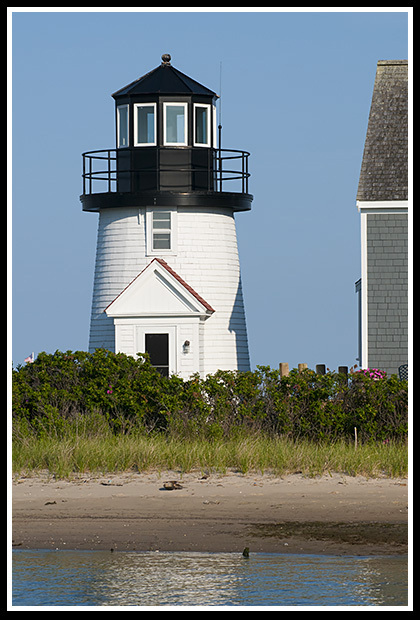 The lighthouse is listed as Lewis Bay Lighthouse, but is commonly referred to nowadays as Hyannis Harbor Light. 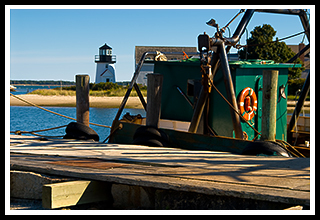 Hyannis is the largest city in Cape Cod with plenty of recreational activities, and you take ferries out of the harbor to the islands. There are a variety of museums to explore like the Maritime Museum, the John F. Kennedy Museum, the Toad Hall Classic Sports Car Museum, various art museums like the Cahoon Museum of American Art, or visit the Heritage Museums and Gardens, in nearby Sandwich. The Cape Cod Symphony Orchestra performs in Cape Cod's Barnstable Performing Arts Center, Cape Cod's premiere concert hall in Hyannis. For something a little different, visit the Cape Cod Potato Chip Factory and sample the end results, or buy tickets at The Cape Cod Melody Tent in Hyannis, which offers plenty of music and theater acts during the summer season. For a unique land and water experience, take a ride on the Cape Cod Duckmobiles. In Hyannis, continue south on Ocean Street to Gosnold Street. Turn right on Gosnold Street and drive to Harbor Road. Turn left on Harbor Road, where the lighthouse will be on your right near the end of the road. Boat cruises and ferries mentioned below may offer many types of cruises. Those mentioned below pass by Hyannis Harbor Lighthouse regularly on their cruises, tours, and charters. Enjoy! Offers a Hyannis Harbor cruise that provides close views of Hyannis Harbor Light and the Kennedy Compound for tourists. Sailing cruises includes Hyannis Harbor. They provide sailing charters that pass by Hyannis Harbor Lighthouse. 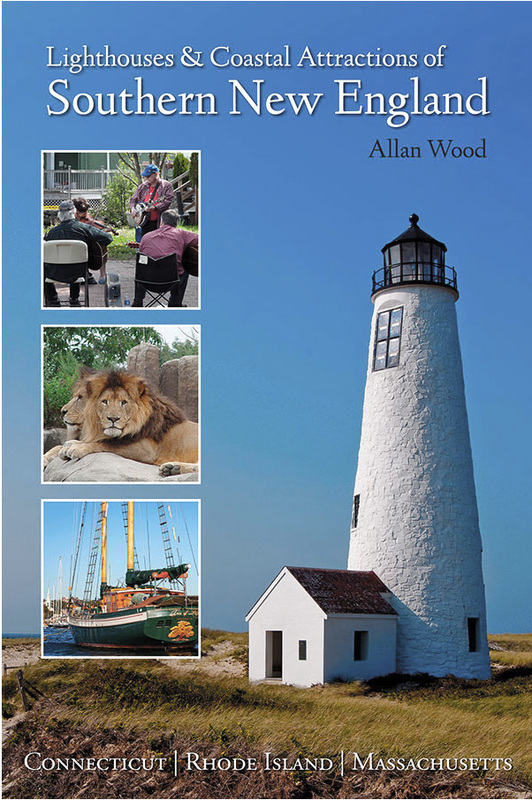 My book, Lighthouses and Coastal Attractions of Southern New England: Connecticut, Rhode Island, and Massachusetts, provides special human interest stories from each of the 92 lighthouses, along with plenty of indoor and outdoor coastal attractions and tours you can explore in these southern coastal states. For more info, visit my Lighthouse Books page.